Bell 412 1/48 Die Cast Model - L.A.F.D. 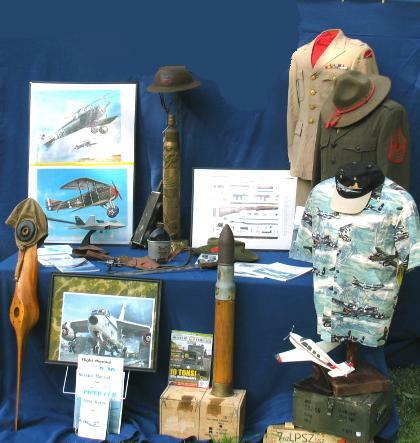 W ings and Things Military Collectibles was formed as a business in 1993 based on my long time interest in aviation and military history. It has been expanding in size ever since the days of selling a few military items at the Military Vehicles Show at Fort Indian Town Gap, Pennsylvania from a folding card table and out of a Chevy S-10 Blazer to my present day inventory of thousands of general military and aviation items, with internet and mail order services plus a fairly heavy military and air show schedule around the eastern United States. As you look through the on line catalog, you will find all types of military and aviation items offered for sale, ranging from art work to books, manuals, uniforms, die cast, wooden and plastic scale models, Civil War, WW I, WW II, Korean War, and early Vietnam military collectibles, militaria type home decor items, as well as early civilian and warbird aircraft parts, in addition to military vehicle parts. If you do not find what you are looking for in the listings, please e-mail me with your request. I do not have all the inventory listed and new collectibles are arriving daily. Please bookmark this page for future reference. Also please read company policies along with shipping and return instructions before purchasing items. Thanks to all of my loyal customers and to the new ones coming aboard for visiting the website.